The Sanders campaign is where Clinton was in 2008. If it wants to do better, it should learn from her lessons. 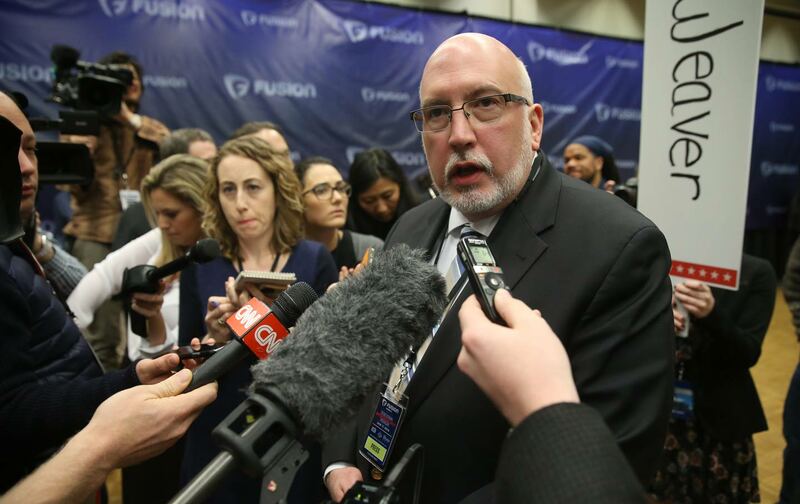 As Senator Bernie Sanders cruised to a big win on Tuesday, his campaign manager, Jeff Weaver, made two bold statements that Hillary Clinton supporters found questionable and offensive. The clash highlights the difficulties the Democratic Party is going to have reconciling Clinton and Sanders supporters in the fall—difficulties that will be serious, on both sides, but I don’t believe insurmountable. I’m going to let someone else talk about what the Sanders forces will find tough about falling in line behind Clinton. I know there are a lot of issues. As a Clinton supporter and a lifelong Democrat who nonetheless wants Sanders to succeed in pulling the party to the left, let me explain what was wrong with Weaver’s comments. And let me try to tease out the difference between his first two provocative pronouncements. Then, as I was finishing this piece, another skirmish broke out over Sanders’s saying Clinton was “not qualified” to be president—which probably sounded more insulting than it might have, had Weaver not made those other remarks this week. Clinton supporters, including me, found these statements wildly provocative. But they’re actually different, in tone and in substance. The comment about Clinton’s “destructive” ambition was arrogant, condescending, and, yes, sexist. In response to Weaver, MTV’s Jamil Smith revived this on-point 10-year-old chestnut from The Onion: “Hillary Clinton is too ambitious to be the first female president.” Clinton and Sanders are running a spirited campaign for the presidency, which has been mostly high-minded and collegial, with occasional sharp elbows thrown by both parties. How did her ambition come to be the one that’s called “destructive”? (One guess.) Arguably, since Sanders is trailing in pledged delegates, in the popular vote, and even in the number of states won to date, and since he is the candidate that analysts give virtually zero chance of edging Clinton, one could argue that is his “ambition” that threatens to “destroy” the party. I am not arguing that. Nor am I saying—just as no serious Clinton supporter is saying, to my knowledge—that Sanders should drop out of the race. Clinton herself stayed in it, competing with President Obama, until the very last 2008 primaries (she won two out of three in early June of that year), even though Obama backers demanded as early as February that she suspend her campaign. I think it’s good for the party if the nomination contest continues. I throw no shade at Sanders just because he’s a Democrat-come-lately; as I’ve written repeatedly, I’m happy he’s running inside the party, not undermining it like Ralph Nader did in 2000. I support his effort to pull it to the left. The question, though, is how. That brings me to Weaver’s other comment, about looking forward to an “open convention.” It was certainly provocative, but it also represented Weaver doing his job. He wants to find a way to make the ultimate case for Sanders as the Democratic nominee—and for Sanders to have maximum impact at the convention, on the platform, and in the party going forward, if he falls short. So I have less of a problem with it, even if I cringed when he said it. I cringed partly because the Clinton campaign never called for anything like an open convention. But hey: Sanders isn’t bound to the rules the Clinton camp followed eight years ago. Although lots of people have compared the nastiness of the 2016 Democratic contest to the historic 2008 campaign between Clinton and Barack Obama, as a veteran of both, let me say definitively: Two thousand eight was far more bitter, on both sides. Back then, Clinton was in Sanders’s place: running a strong but perpetually behind campaign, with lots of victories later in the game, but probably too far in back of Obama in pledged delegates to ever catch up. There were worries about bringing the two wings of the parties together–worries that neither campaigns did anything to assuage until it was over in June. By contrast: Yes, there’s a loud #BernieOrBust movement on social media, but there were, objectively, far more Clinton backers in 2008 who swore they’d never vote for Obama. In May of that year, exit polls from Indiana showed almost half of Clintonistas couldn’t imagine a vote for Obama; at the end of the primaries, CNN found that 35 percent felt that way. Meanwhile, in Wisconsin, exit polls showed about a third of Sanders supporters in that decisively pro-Bernie state said they wouldn’t vote for Clinton. That’s a worrisome number, but it’s not what we saw eight years ago. But comparisons of 2008 and 2016 fail in a lot of ways, including one major dynamic: There were few ideological differences between Clinton and Obama. Pulling their forces together was largely a matter of personal and political respect, which was a tough challenge, since it was lacking on both sides. But by contrast, the Sanders campaign is trying to pull Clinton, and the party, to the left. So making up at the end of this contest won’t be as easy. They’ll even interview the front-runner. That was a magic moment. And here’s a question for the Sanders forces now: How do you deny the first leading female candidate the Democratic nomination for president, when she’s ahead in the pledged delegates, the popular vote, and even the number of states won, as she almost certainly will be? The answer is: You can’t. If that’s the way Clinton comes into the July convention in Philadelphia—ahead in delegates and the popular vote, but just shy of the goal, without superdelegates—Sanders, and the party, absolutely can’t. And I predict the party won’t. All of this is ironic, given that his campaign has suggested that getting rid of superdelegates would be one issue on which he would want to press Clinton if he winds up in Democratic platform negotiations. And again, as a veteran of 2008, I know that the Clinton folks had stopped talking about appealing to superdelegates at this point in the race; they were too busy arguing that she had the right to continue to compete for pledged delegates. One more 2008 comparison: That year, Clinton was behind in pledged delegates, but leading in the popular vote slightly. She nonetheless didn’t press her cause at the Denver convention. None of her campaign leaders ever called for an “open convention.” So while the lefty in me understands why Sanders and Weaver would, and perhaps should (in the reasoning of his supporters), the feminist and the lifelong Democrat in me says: Rethink this, Sanders folks, if Clinton goes to Philadelphia with a lead in pledged delegates. Please. Even if he wrests away the nomination somehow, he’ll alienate Democratic women, and perhaps Republican and independent women too. He’ll also alienate black women even more than he already has with his campaign’s constant dismissal of Clinton’s victories in the South. We all feel confident that no Democrat can lose to Donald Trump or Ted Cruz, but I can honestly think of one way: If a Democrat were stupid enough to insult female voters, early and often. So while I believe there could ultimately, theoretically, be a path for Sanders to take his crusade to the Democratic convention if he’s behind in pledged delegates, I would hope it never happens. I can understand why his campaign might think that’s their best leverage, because I worked hard to wrap my brain around it, as a member of the left wing of the party he is trying to represent. I can imagine accepting it. But only—and I feel this is a long shot right now, but I am open to being convinced—if he can do it without the air of condescension and entitlement his campaign exudes right now.